These Chocolate Raspberry Crumb Bars are adapted from an old recipe I posted years ago and forgot about. The recipe also needed a new photo, so of course that was the perfect excuse to make a batch this week. The bars are so good! The bottom layer is a buttery shortbread, the middle layer is a very soft and not overly sweet fudge, and the top layer is a mixture of crumbs, walnuts and chocolate chips. The original recipe from Nestle calls for a 9×13 inch pan and uses a full 14 oz can of condensed milk, but if you have half a can of condensed milk you need to use, you can halve the recipe and make it in an 8 inch square pan. 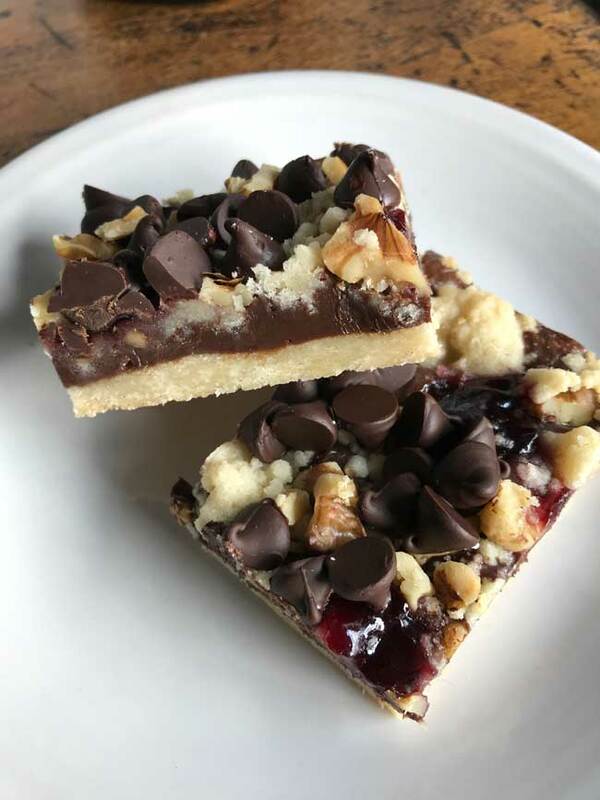 Fudge filled shortbread bars with a crumbly topping mixed with walnuts, raspberry preserves and chocolate chips. Preheat oven to 350 F. Grease 13 x 9-inch baking pan. Beat butter and sugar in large mixer bowl until creamy. Add flour and stir until crumbly. With floured fingers, press 1 3/4 cups crumb mixture onto bottom of prepared baking pan; reserve remaining crumb mixture. Bake for 10 to 12 minutes or until edges are golden brown. Combine 1 cup chocolate chips and sweetened condensed milk in small, heavy-duty saucepan. Warm over low heat, stirring until smooth. Remove from heat and add vanilla; quickly spread over hot crust. Bake for 25 to 30 minutes or until center is set. Cool in pan on wire rack. Cut into bars.